JUNEAU, Alaska — Alaska Gov. Sarah Palin said she will attend an exclusive club dinner in Washington this weekend because it could offer her an audience with President Obama. In an impromptu, eight-minute meeting with reporters Wednesday outside the governor’s mansion, the former Republican vice presidential candidate also detailed reasons why she’s started her own political action committee and laughed off suggestions that she’s in line for an $11 million book deal. “How often will I get an opportunity to have dinner with the president? 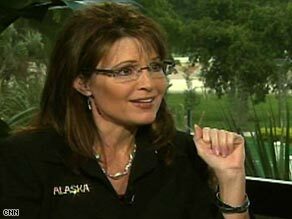 I will take up that offer to do so,” Palin said. Gov. Sarah Palin says she will support President-elect Barack Obama and his new administration. The Alaska governor said in an interview with CNN’s Wolf Blitzer that she would be willing to help if Obama asked her for assistance on some of the issues she highlighted during this year’s campaign, such as energy or services for special-needs children. “It would be my honor to assist and support our new president and the new administration,” said Palin, whom Sen. John McCain chose as his running mate in August. “I speak for other Republicans and Republican governors, also,” she said. FOX News’ Greta Van Susteren is in Alaska to get Gov. Sarah Palin’s reflections on the presidential election. After a whirlwind campaign alongside Sen. John McCain, Sarah Palin is defending herself against criticism stemming from the tens of thousands of dollars spent on her wardrobe as well as several reported foreign affairs missteps. 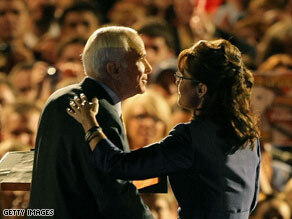 Sources close to John McCain say Sarah Palin was denied a chance to speak at McCain’s concession address. (CNN ) — Alaska Gov. Sarah Palin called former aides of Sen. John McCain “jerks” for circulating unflattering stories about her since the Republican ticket lost its bid for the White House Tuesday. The stories, which have been attributed to unnamed sources within the McCain campaign, include claims that Palin did not know Africa was a continent instead of a country, or which countries are part of the North American Free Trade Agreement, despite touting her familiarity with neighboring Canada. Speaking with CNN’s Gary Tuchman after returning to Alaska, Palin speculated those stories may have originated with campaign staffers who helped her prepare for her debate with Democratic Vice President-elect Joe Biden. Watch the clip from The O’Reilly Factor below. Vice presidential contender Sarah Palin told ABC in an interview to air Thursday that she’s not going to leave national politics if she doesn’t enter the White House in January, fueling speculation that she’s considering running for President in 2012. “I think that, if I were to give up and wave a white flag of surrender against some of the political shots that we’ve taken…I’m not doin’ this for naught,” Palin told ABC’s Elizabeth Vargas on being asked.